This is a fun new game from Playtech with 50 paylines and fun bonus games. The number of top class video slots produced by Playtech this year tops all other providers and this is the start of a new range of childrens tales told in the form of online slots. 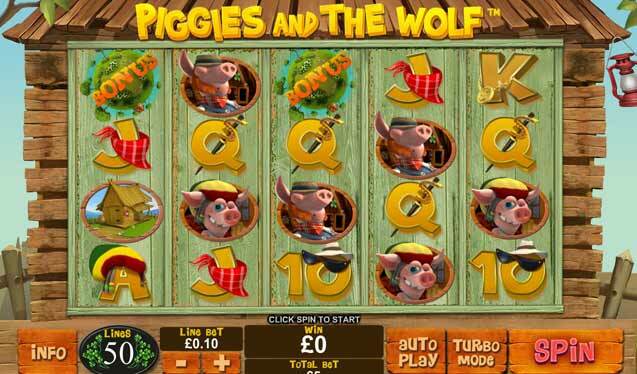 Online slots teeling the tale of 3 little pigs. The animation and cartoon style story telling of this video slot is great and the bonus games are even better. The game has wild, scatter and bonus symbols that can payout up to 2500x your line bet. 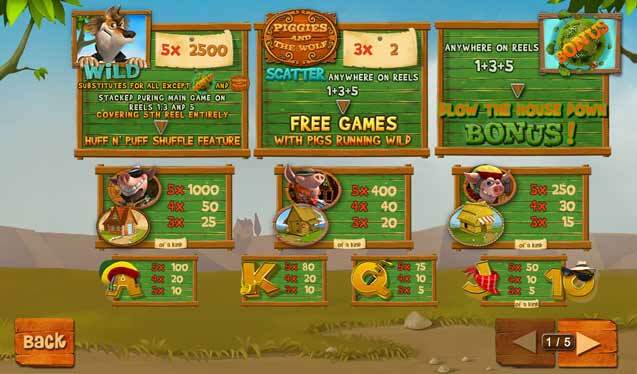 Scatter symbols on reels 1, 3 and 5 will award free spins. You get 15 free spin with an added wolf chase feature. Spin 3 or more bonus symbols on reels 1, 3 and 5 and you will enter the bonus game. In this game the wolf is hunting the pigs and you choose the tool/technique he uses to blow the houses down. You get three chances to huff and puff to blow the houses made of straw, wood and stone down to win prize money.